When considering the harvesting of a block, it is easy to overlook the complexities of other legislation and societal obligation. Such an example is the management of archaeological sites, both Maori and non-Maori. Many forests have been planted over archaeological sites, and forest managers today have inherited the responsibility of their protection during harvest and replanting. Landowners may not be aware of sites on their land, but it is still remains an offence to damage or destroy them. As a professional service provider, PF Olsen invests in training its staff and contractors to handle archaeological site management. During September, PF Olsen ran an Archaeological Site Awareness training course with the help of archaeologist Lynda Walter from InSitu Heritage Ltd. PF Olsen contractors routinely work around recorded archaeological sites, however there is always the chance that they may come across previously unknown sites. The day began with a classroom session in Awakeri where Lynda and PF Olsen Environmental Manager Kit Richards briefed the 50-odd staff and contractor audience about the types of historic sites that exist today, why they are important, and our legal obligations to protect them. 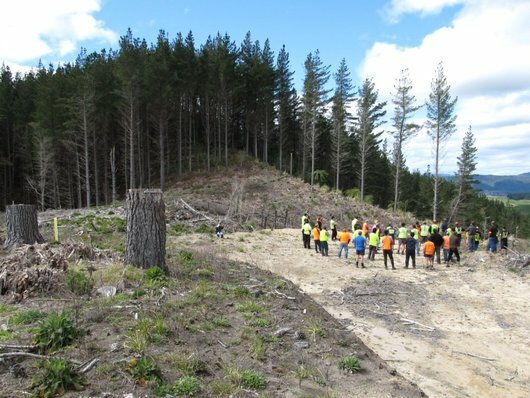 After morning tea, the group headed out in convoy to nearby Sisams forest to a Maori pa site complete with kumara pits and defensive ditches. Lynda described the typical features of sites that will aid staff and contractors in identifying unknown sites, particularly those of early Maori occupation. 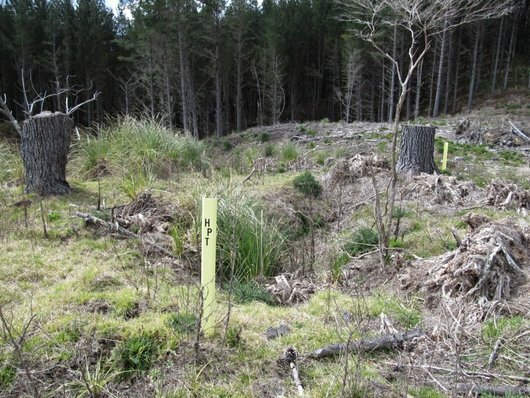 A kumara pit in Sisams forest. Note the yellow PF Olsen' HPT markers that identify known archaeological sites. The group on site in Sisams forest. A Maori pa site is on the top of the hill to the left.